Following the recent restoration which has returned the painting to its original appearance, the Museo del Prado presents one of the most important works by the Bolognese artist Annibale Carracci (Bologna, 1560 - Rome, 1609). A contemporary of Caravaggio and a member of one of the leading Italian artistic dynasties, in the late sixteenth century Annibale developed a new style of painting together with his brother Agostino and his cousin Ludovico. Their innovations were based primarily on a rejection of Mannerism and a return to nature, taking their knowledge of the Renaissance tradition as their starting point. Around 1582 they founded an Academy in Bologna whose pupils included Domenichino, Francesco Albani and Guido Reni. The present exhibition analyses the creative process behind the work, painted between 1588 and 1590, prior to Annibale's definitive departure for Rome. It includes two related preparatory drawings and the X-radiograph. 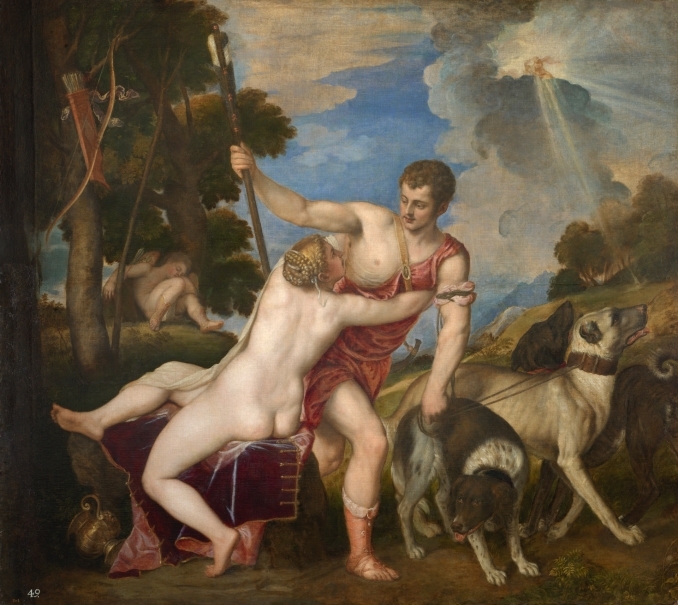 In addition, it aims to reconstruct the artistic context in which the work was made through the inclusion of its most direct sources of inspiration: the paintings of Venus and Adonis by the Venetian artists Titian and Veronese. Born from the incestuous union between Cinyras and his daughter Myrrha, Adonis was admired from childhood for his beauty. A keen hunter, one day he was making his way through the forest when he came by chance upon the beautiful Venus. She had been playing with her son Cupid whose arrow grazed her breast, provoking the sudden infatuation which she experienced for the youth. Venus was aware of the fate that awaited Adonis if he hunted wild animals and for that reason attempted to warn him of the imminent danger. Despite her words, Adonis left in pursuit of a boar, which attacked and mortally wounded him. 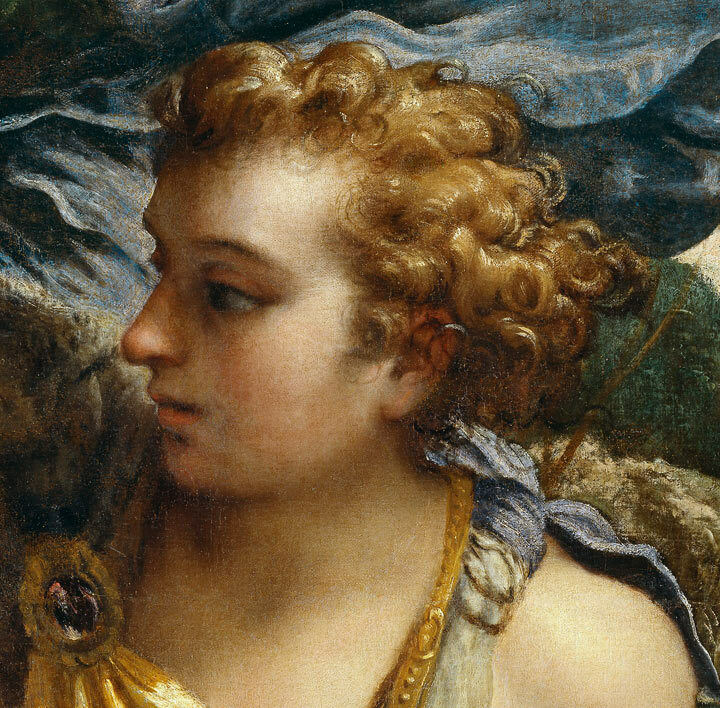 The three paintings by Titian, Veronese and Annibale Carracci form a sequence of images based on the story recounted by the poet Ovid in his Metamorphoses. Carracci depicts the onset of the lovers' passion, while the two Venetian artists show the story moving towards its tragic ending. The feminine nudes and the passionate behaviour of the main characters of the story endowed it with a lascivious and sensual quality that was considered excessive until the second half of the nineteenth century, being this the reason for the concealing of these paintings in the "Sala Reservada" of the Museo del Prado. One of the most interesting modifications to the painting revealed by the X-radiograph relates to Adonis's head. Initially it looked out towards the spectator (Fig. 1). Annibale later modified its position, with the face almost in profile and looking towards Venus (Fig. 2). By doing so he focuses our attention on the passion suddenly arose between the two lovers. The X-radiograph reveals the succession of compositional changes which the artist introduced during the course of the work's elaboration, and provides interesting information regarding his painting technique. It also shows the damage caused by the fact that the canvas was stored folded for a long period, probably while it was waiting to be restored after the fire at the Alcázar (Royal Palace) in Madrid in 1734 when it was badly damaged. The photographs reveal that Adonis's left arm was modified various times. Initially (Fig. 1), Annibale painted the hand holding a spear that extended in front of the nose of the white dog. In a second attempt (Fig. 2) the artist slightly lowered the arm, while the third and final change (Fig. 3) has it aligned with the body in a parallel sense, the spear replaced by a bow. These variations indicate a change in the narrative approach, which evolved from a dynamic to a more static one, and Annibale was consequently obliged to alter the way the dog was facing as it originally looked in the opposite direction, corresponding to the initial raised position of Adonis's arm. The restoration process of the painting is summarised in this sequence of four images of Adonis's leg. The first shows the appearance of the painting before any intervention (Fig. 1). It reveals the presence of thick layers of oxidised, yellowed varnish which veiled the original paint, as well as the significant deterioration of the paint surface (Fig. 2). The latter was probably the result of the smoke and heat from the fire at the Alcázar (Royal Palace) in Madrid in 1734 where the painting was hung. The second photograph, taken during the cleaning process, shows some of the losses to the paint surface revealed by the removal of later areas of repaint which distorted the work's appearance. The third photograph, before retouching, shows how the losses are filled with stucco made of chalk and glue (Fig. 3). Two types of stucco filling areas are visible: the old ones, which are orangeish in colour, and the modern ones, which are whiter in tone. The fourth and last image corresponds to the final result of the restoration after the retouching (Fig. 4). The exhibition is accompanied by a publication edited by Andrés úbeda, Chief Curator of Italian and French Painting at the Museo del Prado and curator of the exhibition. It includes his article on the history of Carracci's painting and its critical fortunes, another on the painting's restoration, written by María álvarez-Garcillán, and a third on the analysis of the digital image, by Ana González Mozo. Given that the principal intention of this project is to explore Carracci's creative process, particular importance has been given to the accompanying images in order to allow for a better understanding and assessment of this major masterpiece. Palabras preliminares, Sir. Denis Mahon. Presentación. Andrés Úbeda de los Cobos. 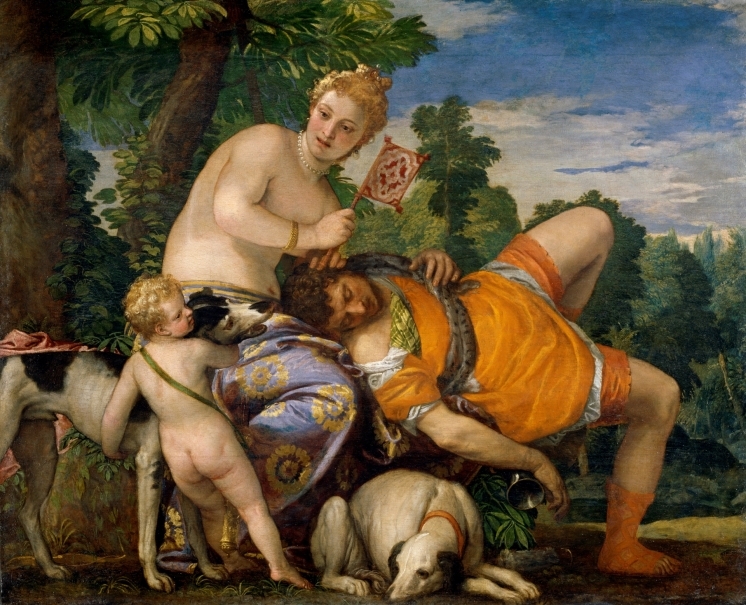 Venus, Adonis y Cupido Ad emulatione di Tiziano. Andrés Úbeda de los Cobos. 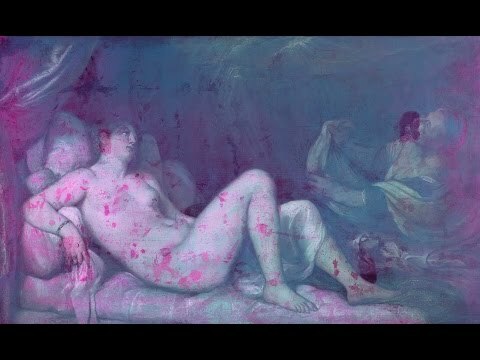 La restauración de Venus, Adonis y Cupido. María Álvarez-Garcillán. 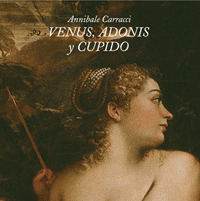 Venus, Adonis y Cupido, de Annibale Carracci. La construcción de bellas imágenes. Ana González Mozo.